Proving that a great show is always in fashion, Love, Loss, and What I Wore, with its starry rotating cast and compulsively entertaining subject matter, has become an international hit. The all-star cast features Dee Hoty (Mamma Mia! ), Sabrina LeBeauf (The Cosby Show), Amanda Setton (The Mindy Project), Zuzanna Szadkowski (Gossip Girl) and Dawn Wells (Gilligan’s Island). During Social Media Night on Thursday, June 6, audience members may live-tweet and enjoy a one-night-only Q-and-A session with the cast. Special seating will be required to live-tweet during the show. Call 480-499-TKTS (8587) or visit the Patron Services Box Office to secure your “tweet seats” for this fun and entertaining night. Are you a techie interested in the fashion industry? Join PHXFW Executive Director Brian Hill for an enlightening presentation this Wednesday at Gangplank Chandler! Learn how fashion and technology work together and explore the digital, software, photography and video opportunities available at PHXFW 2013! We are happy to announce that we have extended our reach and will be partnering with Planned Giving RoundTable of Arizona for their 2013 Annual Summer Forum Wednesday, June 12th to host our signature Log-In Lounge Installation! If you are a non-profit media professional/blogger with a non-profit focus, email lauren@phoenixfashionweek.com to secure your Media Registration! 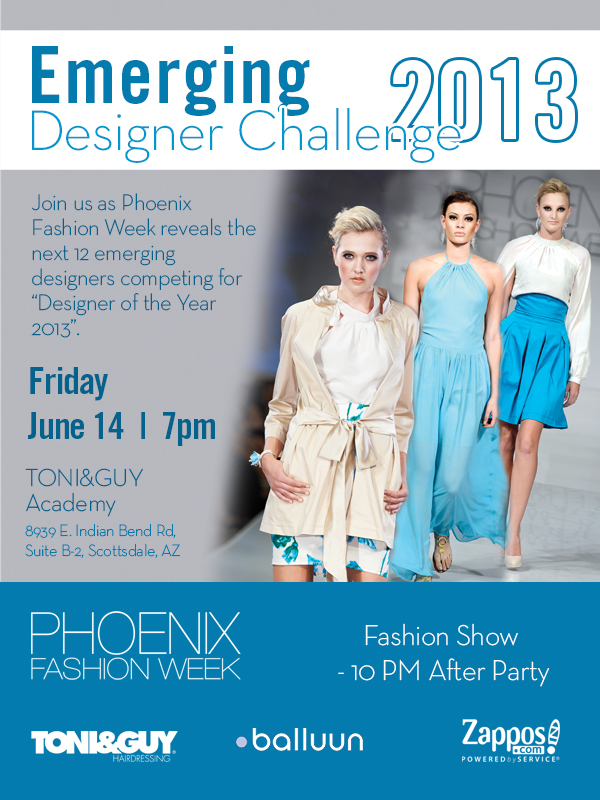 Phoenix Fashion Week is hosting their 5th annual ‘Emerging Designer Challenge’ on Friday, June 14th, 7pm at the TONI&GUY Academy in Scottsdale, the “Official Hair Salon of PHXFW 2013”! This official announcement highlights the fall 2013 Emerging Designer line-up, along with a trunk sale by this year’s accessory designers presented for the first time to the public. This year, Phoenix Fashion Week is introducing 12 new Emerging Designers to show at fashion week in the fall. These designers have the opportunity to launch their brand at the ninth annual Phoenix Fashion Week at Talking Stick Resort, October 1-5, 2013. This year’s Emerging Designers were discovered following Phoenix Fashion Week’s successful eight-city tour of the United States, including Phoenix, Los Angeles, San Francisco, Salt Lake City, Las Vegas, St. Louis, Chicago and New York. These next “IT” designers will compete for a $10,000(value) prize package consisting of goods and services to help launch their brand. The Emerging Designer Challenge is supported by TONI&GUY Hairdressing, Balluun.com, and Zappos.com. An after party will directly follow the event at 10pm and is open to the public. Are you or someone you know an aspiring model looking to make it in the fashion industry? PHXFW is seeking 30 Women and 10 Men to compete for the title of ‘Model of the Year 2013’ -Phoenix Fashion Week is on the lookout for the next “Top Models” in Arizona, to be featured in PHXFW this fall! The winner will receive a modeling contact from The Agency Arizona! Join us June 22nd for our official Model Search, location TBA. More more details, visit our Facebook event page! We want to know…which event this month are you most looking forward to? Share with us in the comments below! Whether you attended one or all of the runway shows during fashion week this year, you would have seen a variety of talented local and global designers. However, the models wearing these designer garments on the runway are just important as the clothes themselves , as this is the best selling point to the consumer. A model who not only wears a garment, but can sell it to an audience and help them see themselves in it, will stand out from other crowd beauties any day. This year’s ‘Model of the Year’, Alexis Hamilton, no doubt fits this description. Since winning the title of Phoenix Fashion Week’s ‘Model of the Year’ and receiving a prize package, including a signed contract with The Agency Arizona, Hamilton has walked for many local luxury brand fashion shows, including Neiman Marcus and Nordstrom. I had the opportunity to catch up with this runway queen via phone to talk about how life has changed since fashion week and her personal tips for selling it on the runway! Q: What is your background in modeling? Q: What was your journey like leading up to fashion week? 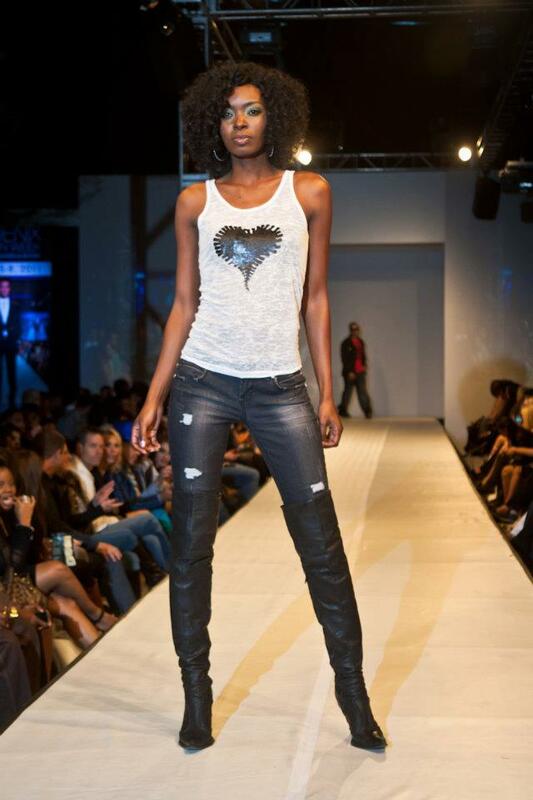 Q: Congrats on winning the runway challenge….which was your favorite challenge and why? Q: What was it like winning the title of ‘Model of the Year’ and being signed to an agency? Q: How has your life changed after fashion week? Q: How do you think other emerging models can benefit from PHXFW? Q: Can you offer any advice to aspiring models hoping to make it in the industry too? *We love feedback! Post a comment or question on this blog post for a chance to win a PHXFW T-shirt!